Object: A flag and/or a poppy. This week we celebrate a very special holiday. - It isn't Thanksgiving, even though it is a day to give thanks. - It isn't Independence Day, even though it is a day to celebrate freedom. - It isn't Valentine Day, even though it is a day to think about love. The holiday we celebrate this week is called Veterans Day. This holiday is celebrated in many countries around the world. In some countries it is called Armistice Day. In others it may be called Remembrance Day. No matter what you call it, it is a day on which we honor the men and women who have served in the military. We also honor those who have died for the cause of freedom. It is a time for us to say "Thank you" for the sacrifices they have made. It is a time to think about the freedoms we enjoy because they were willing to serve. It is a time to think about love -- the love they showed for their country and for their fellow man. How do we celebrate Veterans' Day? I guess many people will celebrate it just like they celebrate any other holiday. They will go to the mall and go shopping! I would like to suggest some other ways we might celebrate this important holiday. - Fly a flag in your yard to remind others that this is a day to honor those who have served. - Spend some time in prayer. Give thanks to God for those who served to defend the cause of freedom. - Observe two minutes of silence. 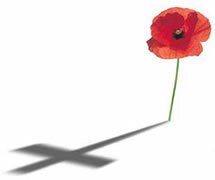 Concentrate on remembering those who have died defending the cause of freedom. - Wear a Poppy. A Poppy is a red flower which is worn in remembrance of those who died for their country. The poppy was chosen because of a poem “In Flanders Fields” written by John McRae honoring the soldiers who died in the fields of Flanders, France during the First World War. Veterans Day is a holiday that we take very seriously, but that doesn't mean that it is a time to mope around and be sad. It is a happy occasion indeed. We can be happy that because of the sacrifice of these brave men and women, you and I enjoy great freedom. We can also be happy that even though many of these brave soldiers died in battle, that is not the end of their story. Here is the rest of the story -- those who had put their trust in God will be raised and will go to be with the him. That is a promise from God's Word. Listen to these words from the book of Job, "My flesh may be destroyed, yet from this body I will see God. I will see him for myself." You know, that promise is not for soldiers alone. It is for you and me as well. It is for all who put their faith and trust in God. Jesus said, "Those who are considered worthy of taking part in the resurrection are like the angels. They can no longer die. They are God's children." We are God's children and one day we will see him. Won't that be a wonderful day! Dear Father, we remember and honor those who have served to preserve and protect our freedom. We also celebrate the resurrection, because all of us who have placed our faith and trust in you -- even though we die -- will live again. Amen.